Sorry, you can only order up to 429 units of this product! Classically-designed freestanding stove heater with bronze effect handles and large display window - ideal for the home or workplace. 2 heat settings - 925W or 1850W - for optimum comfort & choice. Heats rooms up to 53mÂ². Realistic vivid flame effect without the risks associated with a real log fire. Equipped with a safety thermal cut off device. Size: L41.5 X W27.5 X H54.5cm. Manufacturer 2 Year Warranty Included. 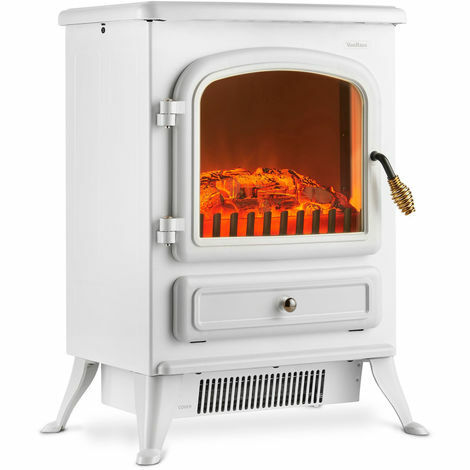 Keep chills at bay and warm your home with the classically stylish VonHaus Electric Stove Heater - equipped with 2 heat settings – 925W and 1850W – for optimum comfort. No need to worry about becoming too hot or too cold, as the heater is thermostatically controlled, automatically switching on or off to maintain room temperature. The stove heater heats rooms up to 53m² but when heat isn't needed, the fire effect can be used independently, so you can enjoy a calming ambience in your home all year round. Large log fire effect display window looks just as stunning as a real wood fire, without the health and safety risks associated with a live flame. Freestanding design is extremely portable and features beautiful bronze effect handles. For your safety and to prevent damage from overheating, the heater is fitted with a safety thermal cut off device. A fantastic choice for the home or workplace. Whatever the task in hand, VonHaus has products to help get the job done. Easy to handle, easy to use, VonHaus gives you a great result every time. From gardening tools to DIY and heating, VonHaus enhances your home, garden and workshop with affordable functionality.